Designed to work for any employee with moderate phone requirements, this fully-featured desktop phone offers complete SIP functionality at a price that fits any budget. The phone has remarkable HD voice and audio quality, simple deployment, advanced call management applications (such as shared call appearance, busy lamp fields, 3-way conferencing, transfer, call waiting, call park, call pickup, intercom and paging), and support for up to 24 lines with an expansion module. 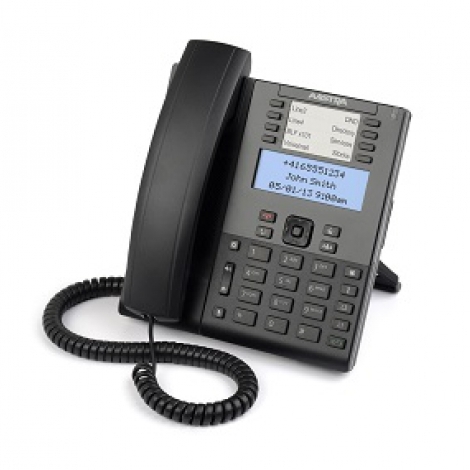 All this makes the Mitel 6865 SIP Phone a terrific choice for those seeking reliable user experience with no compromise on functionality. With a PoE Class 2 rating, this Mitel 6800 Series SIP phone efficiently manages its power consumption and is environmentally friendly.